More than 200 players flooded Tucson R48 V Stop #2 Memorial/Junior WPH Benefit at the Tucson Racquet Club on Friday, with the R48 qualifiers kicking off the action on Friday morning. The largest qualifier draw in Race 4 Eight history featured top big ball players from California “crossing over” into small ball play, top junior and collegiate players from Minnesota and Canada, as well as R48 tour veterans seeking the coveted eight spots in the Tucson R48 V Stop #2 Memorial/Junior WPH Benefit R48 main draw. Top qualifier seeds Jon Iglesias, Vic Perez, Shorty Ruiz, Adam Bernhard, and Abe Montijo advanced to the main draw with straightforward victories. Killian Carroll qualified officially for the first time, while the LAAC’s Carlos Chavez qualified for the first time with a victory against Sal Duenas. WR48 #1 Catriona Casey came within three points of becoming the first woman to earn a R48 ranking, losing in the first R48 17th place final to Ryan Bowler, 15-12. Both Bowler and Casey won three matches back-to-back to advance to the 17th place final. The R48 #2 and Tucson Memorial #1 seed cruised in two games against Shorty Ruiz, Sean Lenning dominated Anthony Selestow, Emmett Peixoto overcame a slow start to defeat Carlos Chavez in straight sets and Tucson Memorial #4 seed and R48 #6 Mando Ortiz defeated his sparring partner Vic Perez in two games. Fifth seeded Daniel Cordova defeated Texas’ Adam Bernhard in two, Luis Cordova defeated Tucson transplant Jonathan Iglesias in two, and Killian Carroll dominated SR48 #1 and Tucson Memorial #8 Marcos Chavez. Local favorite Abraham Montijo was defeated by Ireland’s Stephen Cooney in two games in the final main draw match on Friday evening. 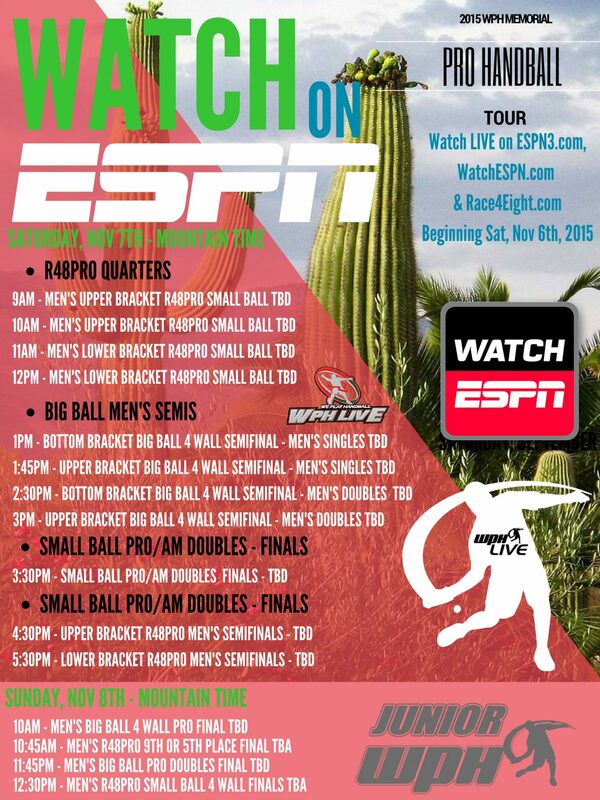 The R48 main draw and playoffs will highlight Saturday’s action, while Big Ball singles and doubles, amateur singles and doubles, and more than 50 junior players competing in small ball and big ball and Junior WPH clinics will fill the courts at the Tucson Racquet Club on Saturday. The World Players of Handball is a non-profit foundation aiming to grow the game of handball through innovation and inspiring the next generation of players through junior clinics with certified WPH coaches, junior tournaments and the Race 4 Eight tour. Donations are tax-deductible donation and support the growth of the game. 100% of the donations received by the WPH go towards junior handball development. Donate on-line at here or send your generous gifts through PayPal (extremehandball@cs.com) or by mailing checks to: WPH, 3561 E. Sunrise Dr. Suite 125, Tucson, AZ, 85718. You can also contact WPH Development Director David Fink at fink@race4eight.com.